Kayrel Edwards, the schoolâs top performer, gained 12 grade ones – 11 of which were distinctions. Dumona Charles also gained passes in 12 subjects; while River Providence gained grade ones in all 11 subjects; and Kalina Browne, Swana John, Stephanie Providence and Shontelle Murphy gained 10 grade one passes. These students came into SEARCHLIGHT to share their elation at having done so well. River and Stephanie Providence (17-year-old twins) shared almost identical grades in their CSEC results. River achieved distinctions in Physics, Chemistry, Biology, Mathematics, Geography, English A, English B, History, Social Studies and French – and a grade one for Information Technology. Stephanie gained 10 distinctions in IT, Physics, Chemistry, Math, Social Science, French, English A and English B; and a grade two for Geography. The sisters, who are the daughters of Dr Karen Providence, said that they were âsatisfiedâ with their performance in the examinations, and relieved that five years of hard work was finally coming to a close. âItâs a good way to close this chapter,â said River. Residents of Green Hill, River and Stephanie admitted that in preparation for their exams, they disconnected their cable television, and eventually got rid of the television set itself. Sixteen-year-old Swana John, who lives in Campden Park, gained 10 grade one passes in Biology, Chemistry, Math, Physics, IT, French, English A, English B, Principles of Business and History. She also received a grade two in Geography. Like the Providence twins, Swana said she also had to cut back on her television viewing significantly – a sacrifice that has surely resulted in her parents Conrad and Melanie Simon being proud of her achievement. Kalina Browne, daughter of Villa residents Mike and Zoila Browne, gained distinctions in Biology, Physics, Chemistry, Math, English A and Music; grade ones in ITm English B, French and Spanish; and a grade two in Geography. The 16-year-old said that she was extremely pleased with her results; and even more so because she did a mixture of subjects, and also maintained her extra-curricular hobbies while she studied for her exams. âYou donât only have to focus on academics to get good grades,â said the all-rounder. She said that she relied heavily on past papers and copies of the subject syllabuses to help her prepare. 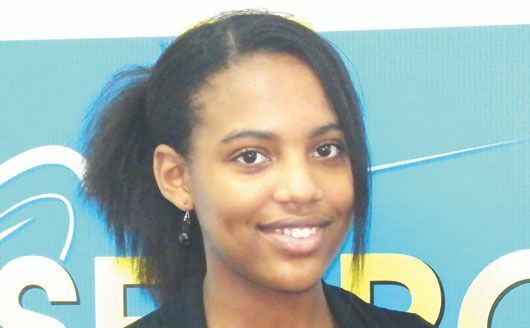 Dumona Charles, daughter of Debbie Charles, passed 12 subjects; with grade one passes for English A and English B. The 16-year-old gained grade two passes for IT, POB, Physical Education, Math and Biology; and grade threes for History, Spanish, Music, Chemistry and Physics. Dumona admitted that she was disappointed with her grades but acknowledged that she did well given her circumstances. âI could have done better,â she said. During Hurricane Tomas, Dumonaâs family house was damaged and in the ensuing repairs, their living situation became chaotic – which she believes negatively affected her study habits, focus, and ultimately her grades. But apart from determination, Dumona believes that her faith in God and prayer saw her through. Over the summer, the girls have been catching up on missed television viewing, doing internships, taking part in foreign student exchange and exploring the island – all things they will have to give up or, at the very least, curtail once they begin their new academic years at the SVG Community College. And as daunting as it may sound, they all are looking forward to attending college; all intending to pursue science-based subjects. Apart from Swana, the college-hopefuls have not yet decided on the exact career paths they want to pursue. Swana was adamant that she would like to become a general practitioner. âI feel like thatâs my calling; to help people. Plus I appreciate the sciences!â she said. The schoolâs headmistress, Andrea Bowman, congratulated all her students who did well in their CSEC examinations, and was pleased with the increase in overall passes. She, however, did express disappointment in the few candidates who failed to submit SBAs, yet wrote the exams âthereby negatively affecting the schoolâs overall pass rateâ. This year the school recorded a 96 per cent pass rate; which is an improvement from last yearâs 94.7 per cent. However, there were 124 students sitting examinations this year, compared to 138 in 2010. There were 100 per cent passes in Physics, Integrated Science, Information Technology, Electronic Document Preparation Management, Theatre Arts, Music, Principles of Business, Physical Education and Sport, Food & Nutrition and Clothing & Textiles. English A and English B recorded 99 per cent passes, while there was a marked improvement in Mathematics, where a 90 percent pass rate was achieved. All other subject areas recorded pass rates between 98 and 83 per cent.